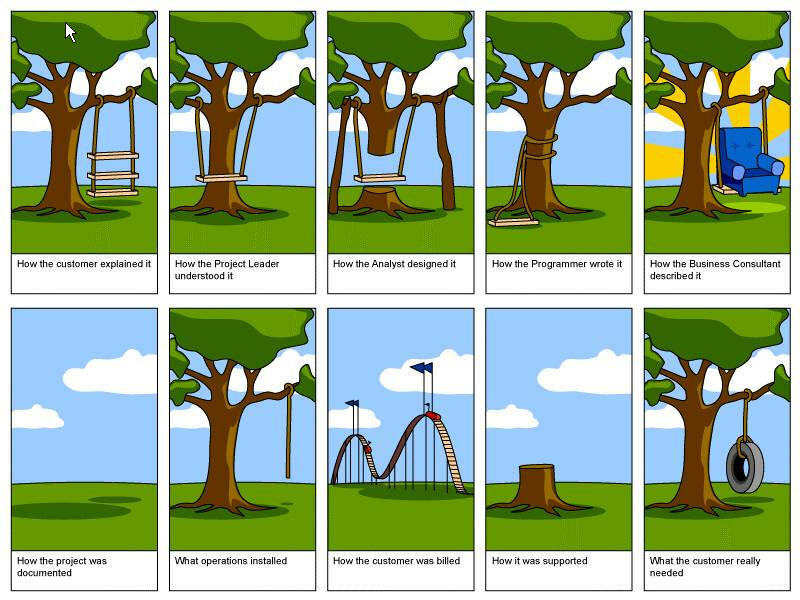 In IT we all know these cartoons where the first picture shows what the customer asked for, the second how the analyst interpreted it, etc. The last picture shows what was actually delivered to the client. Working in IT I'm sure I also made this mistake, but last week found myself making the same mistake outside IT. My girlfriend asked me if I could make a little meditation bench. To illustrate what she meant, she showed borrowed meditation bench and explained that she'd like one minor change: it would be nice if it was possible to fold the bench legs so that it would take less space when it was not in use. No problem! Finally a chance to show off some 'real' craftmenship. So saturday morning I measured the sizes of the borrowed meditation bench, grabbed some wood from the garage, sawed it, bought a couple of hinges and screwed it all together. I tried the bench and then my analysis kicked in: "the bench legs could spontaneously fold in while sitting on the bench causing an abrupt end of the meditation and some pain in the rear end". Of course I had to solve this and turn this risky bench into a rock solid bench. To achieve this a removable support bar was placed between the legs ensuring that the legs could not spontaneously fold in. Because it was removable, you could still fold the legs when storing the bench away. Perfect! Right? Completely happy with my craftmenship I showed the bench to my girlfriend. She took a close look, liked the way the legs folded in and the stability when the support bar was inserted and then tried to sit on it... in a way I had not envisioned. When I tried it out I sat on it like on a normal bench with my legs forward, perfect, no problem. However, the meditation way to sit on it is with the your legs bend under the bench.... and my beautiful support bar made that impossible. Ouch! What did I do wrong? I clearly did not ask enough questions. When people ask you to create something for them you should always make sure that you understand how they are planning to use it. Ask questions, let them demo or illustrate it, ... and be very cautious when they say something like "I want a copy of that one with just one minor adjustment". If you don't understand how they're planning to use it, it's hard to see the consequences of that minor adjustment and the impact it has on the set of valid solutions. (It was possible to change the 'stability solution' to one that did allow for putting your legs below the bench, everybody happy in the end).